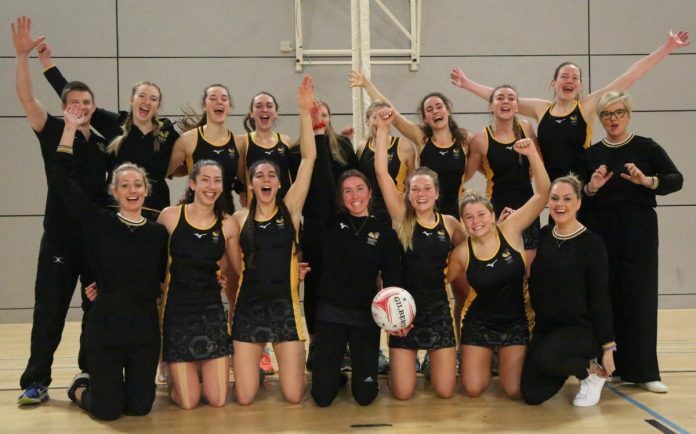 Wasps Netball's under-21s celebrate a season opening win at the weekend. Picture by Clive Jones. IT proved a successful weekend across the board for Wasps, as their under 21s side made a dramatic winning start to the season, whilst Wasps senior international stars featured in the opening fixtures of the Quad Series. Wasps’ under 21s secured a last gasp victory over reigning champions Manchester Thunder thanks to Katarina Short’s goal which edged a 43-42 scoreline in Wasps favour at the EIS Sheffield on Saturday, ensuring Wasps take maximum points in their season opener. The under 19s side also reigned victorious as their season also got underway last month, beating the Mavericks 67-42 and Team Bath 59-38 to sit joint top of the NPL U19 table alongside London Pulse and Manchester Thunder on maximum points. After Wasps senior side’s successful win at the start of the year, there was success internationally for the England Roses in the 54-41 victory over New Zealand, featuring Jade Clarke at wing defence, with Rachel Dunn and Francesca Williams in the squad and set to play a part in the remaining Quad Series fixtures, whilst Bongi Msomi starred as captain for South Africa, who went down 62-45 to Australia. It’s set to be a Wasps international battle when England face South Africa on Saturday at London’s Copper Box Arena, before a return to Superleague Action against London Pulse on Saturday 26th January.